Soft drinks are enormously popular beverages with an annual consumption of more than 34 billion gallons [MadeHow]. For manufacturers in this industry, each product should not degrade in quality despite its high demand. Thus, an efficient and organised flow of operations is required in soft drinks manufacturing. Since this industry has a fast-paced working environment, it must also have a streamlined operation. That is why utilising the industrial computers are ideal computing solutions for automating the processes or data tracking. Amongst the most recommended computing system is the ruggedised PCs with projected capacitive touchscreens. Operators can easily navigate a program and it helps in speeding up operations while minimising errors. 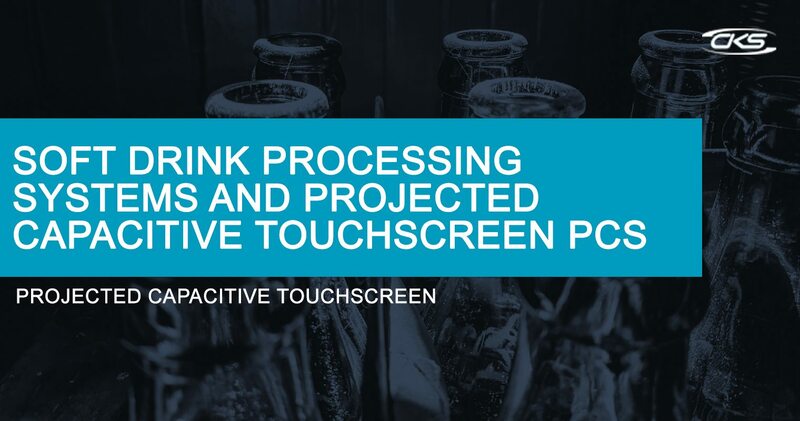 Read through this blog to learn more about projected capacitance touchscreen display computers and their advantages in optimising soft drinks manufacturing process. Basically, the general process of making soft drinks can be divided into the following: preparation of sugar solutions, water de-aeration, mixing of flavours and concentrates, carbonation and, of course, packaging. Now, the process of making soft drinks are becoming automated as well. This is to ensure production efficiency and dynamic operations. With this, computing technologies are integrated into the soft drinks manufacturing process. Do note that these devices should also be easily navigated and user-friendly. Hence, soft drink factories must take advantage of industrial panel PCs with projected capacitance touchscreen technology. By utilising ruggedised panel PC in several phases of soft drinks processing, operations are more streamlined whilst providing high-quality output. So, how can projected capacitance touchscreen panel PC augment soft drinks manufacturing? Let us explore some of its innumerable advantages. Since devices are exposed to different types of liquids in a soft drinks factory, this computing equipment must also have the highest protection available for a device. Apart from that, this computing device has innumerable benefits. Here are the advantages of industrial panel PCs that can help in augmenting soft drinks manufacturing process. Industrial PCs with projected capacitance supports multiple touches. Several gestures such as swiping, pinching, and tapping can be done. The programs installed on this device can be accessed easily as it does not require too much pressure. Therefore, this device is easily operated which is crucial in a fast-paced work environment. Capacitive touchscreen has a protective layer that is highly resistant to scratches and can withstand shock damage. A panel computer with this type of touchscreen technology will continue to function even if it is exposed to moisture or other contaminants. In a work environment where precision and accuracy are a must, panel PCs should have a high-quality display. The optical bonding that is being used in capacitive touch panel PCs produces an excellent image quality. Hence, panel computers with lucid displays offer exemplary viewability which makes it convenient for its operators. Soft drinks factories bear harsh working environments with complex applications. So, it would be a great option to integrate an efficient computing system in its processes. This is to make sure that applications can function effectively in soft drink operations. However, industrial PCs can offer high-quality display, flexible mounting options, easy navigation and reliability. Contact an industrial PC manufacturer today and start building advanced PCs with projected capacitive touchscreen technology.